Before formulating a daily homily on a feast day I read what authoritative sources have to say about an individual saint, it helps remind me of the most significant contributions that person made to the Church and what lesson their life might help illustrate. Today the Church celebrates the feast of St. Dominic, the founder of the Order of Preachers, more widely known as the Dominican Order. While reading a brief biography of St. Dominic I read that one of his most important missions in the Church was his battle against the Albigensian heresy. Now, to must make a public confession, although I did very well in seminary, and I’m sure we covered Albigensianism in one of my classes, this particular heresy wasn’t one I was recalling. So, I did what any modern, newly-ordained priest does when confusion arises…I ‘Googled’ the term. What I found was that the Albigensian heresy basically taught a dualistic approach to creation; that things proper to the spiritual life are good whereas those things in the material world are bad. Furthermore, all of us should take the opportunity to pray in thanksgiving for the dedicated men and women of the Dominican community, many of whom I took classes from during my years of formation. 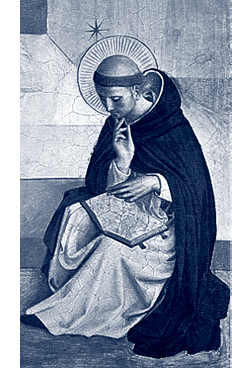 Saint Dominic…pray for us!